ACEINNA’s flow and differential pressure sensors are designed to serve the need for mass flow and pressure sensing in multiple applications such as gas meters, process control, HVAC, medical, chemical, food and beverage, etc. We offer two newly launched and announced product lines, the MFC2000 family of gas flow modules and the MDP200 differential pressure sensor. ACEINNA's patented thermal sensing technology offers many advantages over traditional solutions, including but not limited to: large dynamic range, high accuracy, excellent low flow sensitivity, low pressure drop, very low power consumption, no moving parts for long term reliability, and integrated CMOS circuitry. The MFC2000 gas flow sensor family is a highly configurable, bi-directional flow platform that is being offered in several variations, including 30 and 70 SLM flow ranges, and mechanical configurations including straight inlet, manifold, and PCB mount. The product family is designed for a wide variety of applications, ranging from industrial applications to medical devices. The MDP200 differential pressure sensor is a highly accurate and stable pressure sensor, designed for industrial, HVAC, and medical applications. The sensor is offered in a +/- 500 Pa configuration with custom ranges available. The sensor is available in standard and manifold mount, with straight and angled connector pins. The sensing element is monolithically integrated with CMOS signal processing circuitry and embedded software capable of converting gas flow rates to a digital or analog output with very high repeatability. The module has very low operating power consumption for optimal power management in portable applications. This version is externally powered, up to 5.5V (3.3V typ.). I2C digital output is standard. The MFC2030 includes firmware that is highly configurable, offering the user a variety of settings that can be tailored to specific applications. This includes data output type, calibration settings, measurement modes, and power consumption. A user-friendly PC-based application offers the user a variety of data collection options, including real-time graphical display. Mechanically, the unit includes fittings that can accept a variety of standard inlet tube sizes, both BSP and NPT. Manifold mounting is also available. Click here for more information on configurations. 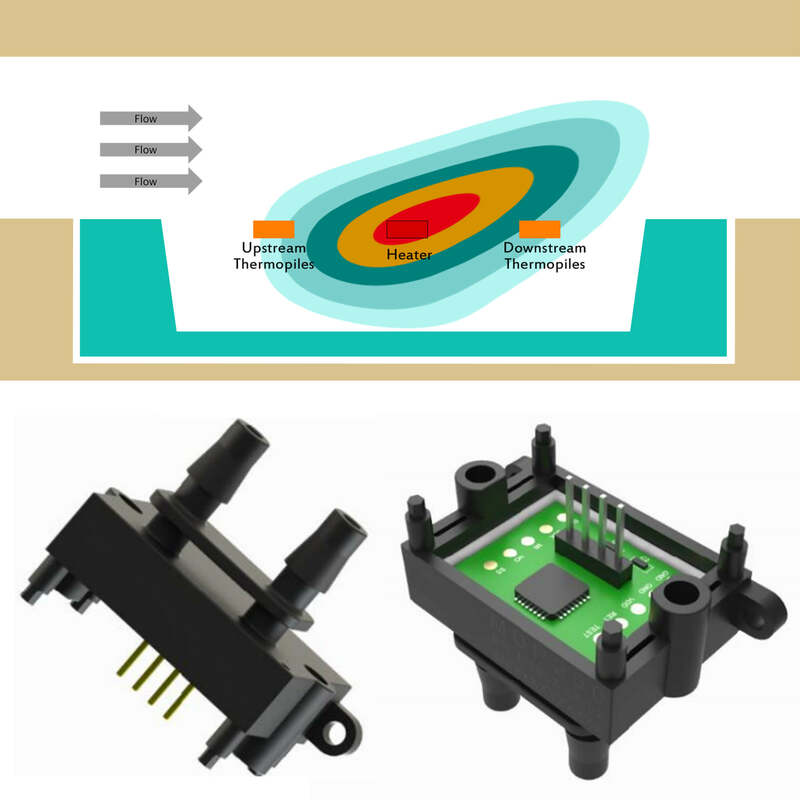 MFC2030 is a true thermal mass flow sensing module, and can easily be configured to suit a variety of applications, from medical flow to industrial processing. Customized versions, including customer specific bulk channel and mounting options are available. Evaluation kits with USB PC interface, PC software and cable are available.